Early 2014 my wife Eveline and I come across a picture of a beautiful Swiss Made vintage chronograph watch which was sold at an auction by Christie’s. We print the picture and stick it to our fridge. Being struck by the beauty of this timepiece we start our research of this unfamiliar brand and their former owners. The study leads to Lebois & Co, a brand founded in 1934 by Raymond Dodane who belongs to the third generation of the Dodane watchmaking family. Upon the approval of the Dodane family Lebois & Co is resurrected, exactly eighty years after the original company was founded. 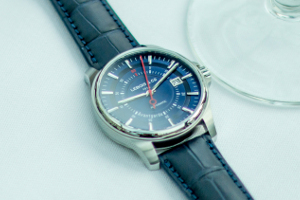 With its new owners Lebois & Co can continue its mission to create aesthetic and affordable luxury Swiss timepieces. Thanks to over 150 investors Lebois & Co is back on the wrist of watch enthusiasts around the world and its collection of new models grows slow but steady. At Lebois & Co we are fine-tuning and mastering the art of the perfect Swiss mechanical watch, keeping the careful balance of history, heritage, and a bit of something new, in every single watch we create. The Lebois & Co shield was designed in 2016 when Eveline and I agreed it was time to have a more meaningful logo designed. The shield is derived from the coat of arms of the Van Wylick family. The Van Wylick family dates back to 1550 and the coat of arms has been used for hundreds of years. Linking the shield to Lebois & Co symbolises that Lebois & Co is now under careful guardianship of the Van Wylick family. It is 11 days before Christmas 1934 when Lebois & Co is founded by French watch manufacturer Raymond Dodane, who represents the third generation of the Dodane watchmaker family. Its mission is clear and simple: create aesthetic and affordable Luxury Swiss timepieces. The Dodane manufacture is founded in La Rasse in the Doubs in 1857, by Alphonse Dodane and his father-in-law François-Xavier Joubert. 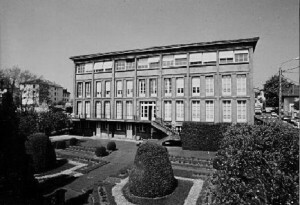 In 1929 the Dodane family settles in Besançon, where Raymond Dodane carries on the traditions of complex watch fabrication. 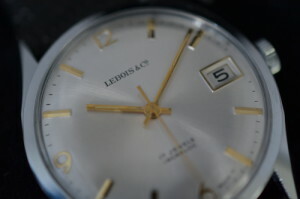 After World War II the brand Lebois & Co is handed over to Italian importers who outsource production to Dodane aswell as other Swiss watch manufacturers. With its new owners Lebois & Co’s primary market is Italy but the brand is also well established in the rest of Europe. Lebois & Co ceases trading 40 years after it was founded, the original Lebois & Co stops producing watches and the brand ceases to exist. 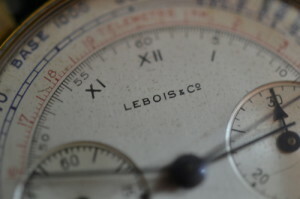 Despite the disappearance of Lebois & Co the brand is still known today and popular with watch collectors all over the world. This beautiful 1945 Lebois & Co Chronograph sold for over $ 6,000 at Christie’s Important Watches auction in 2012. Early 2014 Tom & Eveline come across a picture of a beautiful vintage watch, a Lebois & Co Chronograph which was sold at an auction by Christie’s. They print the picture of this watch and stick it to their fridge. Being struck by the beauty of this timepiece they start their research of this unfamiliar brand and their former owners. Upon the approval of the Dodane family the brand is resurrected, exactly eighty years after the original company was founded. Continuing its mission to create aesthetic Luxury Swiss timepieces. Fitting for these times the new logo for Lebois & Co is crowdsourced and the first model named Avantgarde will be crowdfunded. Lebois & Co launches its crowdfunding campaign on Kickstarter to part-fund the first Re-launch Edition of the Avantgarde Date watch. The campaign is funded at 126% of its goal making it the first luxury Swiss Made mechanical watch successfully funded on Kickstarter! The first watch is sold to over 20 countries around the world. To find out more about our Kickstarter campaign, visit the Kickstarter project page. 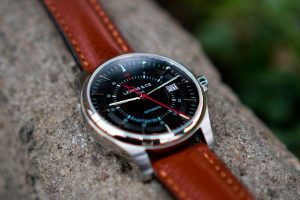 Lebois & Co returns to Kickstarter to part-fund the second Re-launch Edition of the Avantgarde Date watch. The campaign is funded at 104% of its goal and Lebois & Co is proud to be able to start producing its second batch of watches! To find out more about our Kickstarter campaign, visit the Kickstarter project page. 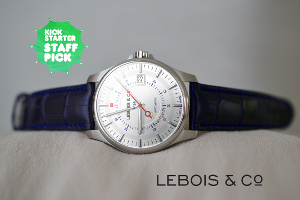 Lebois & Co returns to Kickstarter to part-fund the 3rd Re-launch Edition of the Avantgarde Date. The campaign is funded at 161% of its goal and Lebois & Co is proud to be able to start producing its third batch of watches! To find out more about our Kickstarter campaign, visit the Kickstarter project page.